Chromosphere is a bright, fast paced, side scrolling shooting game where you have to jump and shoot enemies to be able to make it to the end of the stage. It is a classic fast paced arcade game that makes the player engaged, excited, on edge, yet comfortable at the same time. The mechanics and rules of the game are fairly simple and straightforward making it easy to get into. In order for the player to make it to the end of the stage within the time limit and move on to the next level the player must collect speed boosts. There is a very limited amount of speed boosts on one stage, for instance one stage can only have three or four speed boosts so that the player cannot go so fast that they just automatically die. 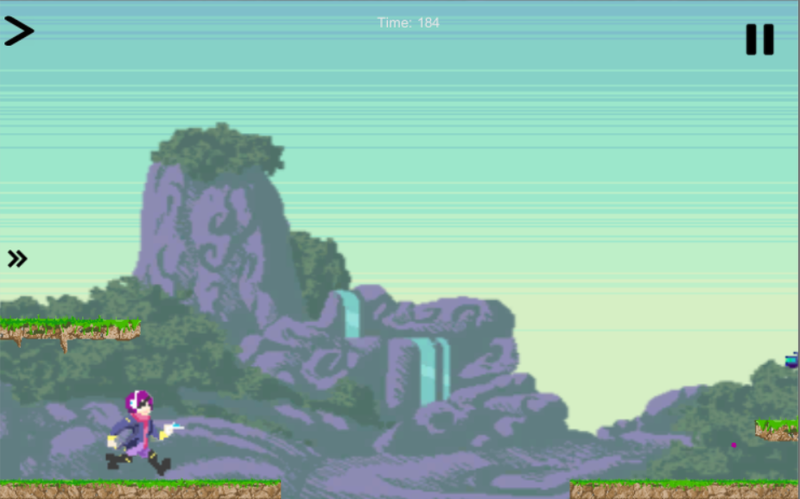 This is possible because each speed boost stacks onto the player's stats until they are shot or run into an obstacle. When a player runs into an obstacle or is shot by an enemy then the player loses a portion of their speed boost.